Miss the Oscars? Watch the Oscars in 60 Seconds from Mahalo Daily. Last night, I was flying from Michigan back to Washington DC and didn’t get home till around 11:30pm. I completely missed the Oscars. I was kind of bummed It’s a show that I usually like to watch every year. Well no worries. The cool kids over at Mahalo Daily did a video synopsis… “The Oscars in 60 seconds.” It’s pretty good. Check it out. I don’t feel as bad about missing the show now. Posted on February 25, 2008 March 6, 2008 Categories Mahalo, Media, My Life, YouTubeLeave a comment on Miss the Oscars? Watch the Oscars in 60 Seconds from Mahalo Daily. This week I was doing some research on php and unicode. I put my search terms into Google and just wasn’t getting what I wanted. It was kind of frustrating. An hour or two later, I decided to try something different. I’d used del.icio.us as my search engine. I found exactly what was I looking for. It really makes the case that human-powered search may be the direction where things should go. Yahoo was genius for snatching del.icio.us up. You’ve seen so many other services which want you to enter in explicit feedback about a Web site (digg, stumble upon) but it just doesn’t make complete sense. It’s hard to get a lot of involvement. With del.icio.us, they take advantage of the natural instinct to bookmark a Web page and organize those bookmarks. 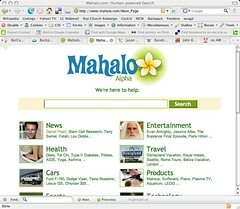 Have you used sites like del.icio.us, Mahalo, or ChaCha as search engines? If so, what do you think? If no, what’s holding you back? With the Web, there has been a publishing revolution. The barrier to entry has almost been eliminated. Anyone with a computer and an Internet connection, can publish there thoughts or creative works. This creates a lot of crap out there. A lot of smart people are trying to figure out how to separate out the wheat from the chaff… the signal from the noise. Jason Calacanis’ idea is Mahalo. It is a search engine with human powered result sets. He has hired a group of guides which will find reputable sites which correspond to a specific search term. If the guides haven’t put together a result set for that keyword, it defaults to Google. While this is clever and interesting, I think this is hardly revolutionary. One of the biggest things I like about Wikipedia is the External Links section down on the very bottom of most topic pages. For example, you go to the Wikipedia baseball page at the very bottom there is a large set of Baseball links in the External Links section. A lot of times I will go to a topics Wikipedia page just to see what external links are there because they’re usually really reliable and are the primary sources. Aren’t the Wikipedia external links just human-powered search results sets? Except with this the links are vetted by the world and not just Jason Calacanis’ search guides. Human powered search is great if you’re only playing with the fat head of search queries. What about the long tail? Mahalo doesn’t have results when I look for more obscure things. I know my friends. I know what their expertises are and what their interests are. I know who trust in some ares and not the others. I’m thinking out loud (well in a blog). Does any of this make sense?